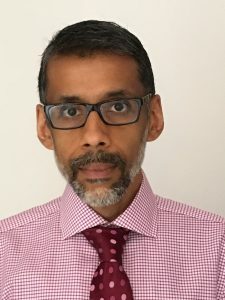 Dr. Mandeep S. Tamber, MD, PhD, joined the faculty of the University of British Columbia Department of Surgery in the pediatric neurosurgery division at British Columbia Children’s Hospital on September 1, 2017. Dr. Tamber began his medical studies at the University of Alberta, Canada, where he earned a doctor of medicine degree with distinction and honors in research. After graduating from medical school in June 1999, he completed his neurosurgical residency at the University of Toronto. During residency, Dr. Tamber worked towards obtaining a PhD degree in clinical epidemiology and biostatistics from McMaster University. He completed a postgraduate fellowship in pediatric neurological surgery at the Hospital for Sick Children, Toronto, and is board certified by the Royal College of Physicians and Surgeons of Canada and the American Board of Pediatric Neurological Surgery. Dr. Tamber comes to British Columbia Children’s Hospital after spending eight years as an academic pediatric neurosurgeon at Children’s Hospital of Pittsburgh, where he was Surgical Director of the Pediatric Epilepsy Program. In addition to the surgical management of pediatric epilepsy, Dr. Tamber’s practice also focuses on general pediatric neurosurgery, including the management of complex hydrocephalus, craniofacial disorders, pediatric neuro-oncology, spinal dysraphism, and pediatric neuro-trauma. His research interests relate to quality improvement and the implementation of evidence-based best practices within pediatric neurosurgery. Perform a PubMed Search of Dr. Tamber’s publications.